How to prepare the sample? For sample amount that originate in bulk amount container (more than 5kg). Samples shall be sent out in portions. Use a clean mixer to homogenize samples a few times. Take out at least 100ml or 100g and transfer into a clean container. Take another 100ml or 100g from another 2 different points and transfer into separate containers. Seal all 3 replicates of samples properly transfer into 3 different zip lock bags. Cut the sample ID label (refer Sampling Procedure attachment) and fill in necessary information. Affix the label tightly on each zip lock bag. For sample amount that originate in retailer/commercial packaging in less than 5kg. Samples shall be sent out in the original packaging. Seal all 3 replicates of samples properly and transfer into 3 different zip lock bags. Cut sample ID label (refer Sampling Procedure attachment) and fill in necessary information. Seal the sample ID label with transparent tape again to avoid damage on the label. How to pack & send the sample? Please make sure each sample is properly sealed and labeled with Halvec Sample ID Label Template (Refer Sampling Procedure attachment). For cold temperature samples, please include ice pack to keep the samples in required storage temperature during transportation. Seal/pack/box all the zip lock bags again and post or courier the samples directly to Halvec or nearest Halvec Collection Center. Please use proper packaging to protect the integrity and conditions of sample throughout the delivery progress. Sample receiving cut-off date: every 2nd and 4th week of Friday. 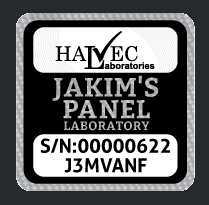 Customer is advised to send out the samples direct to Halvec HQ or Halvec Collection Center before the cut-off date. Customer shall responsible for the cost of shipping to Halvec Collection Center. Types of test depend on the types of sample (matrix). Halvec reserves the right to recommend the most suitable test analysis according to the information given by customer. Certificate of Analysis (COA) will be released upon receipt of full payment. COA shall be given in original hard copy via courier and PDF file (upon request) via email. Halvec reserves the rights to request for re-sampling from customer in the event the samples received are not in good condition. How is the procedure for sampling? You can download and refer to the Sampling Procedure. Where are the collection centers around the world? Please refer to the collection center list. What if my country does not have collection center? Where should I send my sample? If your country does not have any collection center, you can send your sample directly to Halvec Headquarter in Malaysia. How many samples can I send to your lab? You can send as many samples at your wish. What is the cost for the service charge? How do I know if you received my sample ? We will inform you through email upon receipt of the sample. How do you ship my sample? We shall ship via FedEx. Alternatively, we may arrange to ship via your preferred courier service vendor upon request. All freight charge shall be prepaid to Halvec Laboratories. What is the sample collection cut-off time of Halvec Sample Collection Center? The sample collection cut-off time is every second and fourth week of Friday.